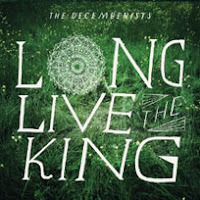 Earlier this year The Decemberists released a new full length, The King Is Dead, which was less conceptual than their previous albums. Now they are releasing a companion EP, Long Live The King, which collects tracks that for whatever reason, didn't fit with the record. Stylistically, the EP is all over the map. The diversity sounds is likely why these songs didn't make the cut on the first go around. That, however, doesn't mean that they aren't strong numbers. The Decemberists venture into pretty much uncharted territory (at least for them) with the southern rocker "Foregone", a hook-filled ditty that tends towards Drive-By Truckers' turf. That's juxtaposed with "Burying Davy". The song, shockingly, has a palour of death that hangs over it. The arrangement is very loosely held together, lending the song a sense of chaos and confusion. The playful "I 4 U & U 4 Me" brings back the sunny side, while "Sonnet" wraps things up nicely with an unexpected horn flourish. The album opener, "E. Watson", seems rather pedestrian at first. The narrative is interesting enough, though the arrangement is somewhat less than compelling. That all changes once the backing vocals begin, creating a chilling harmony. Much like its full length counterpart, Long Live The King doesn't have a unifying theme or story that holds it together. Taken song-by-song however, it is a rock solid entry in The Decemberists' catalogue. Best tracks: "Foregone", "Burying Davy"